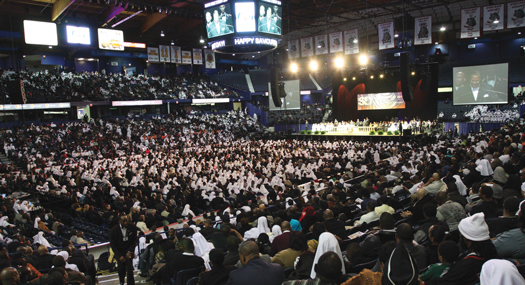 Minister Farrakhan addresses crowd in the Allstate Arena in Rosemont, IL for Saviours’ Day 2011. 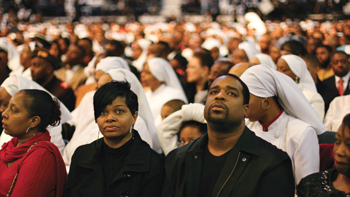 [Editor's note: After a year of steady progress for the Nation of Islam's development in becoming the type of saviours needed to bring healing to the problems that plague the Black community, the Honorable Minister Louis Farrakhan delivered a very special Saviours' Day keynote address to a capacity crowd at the Allstate Arena in Rosemont, Illinois, on Sunday, February 27, 2011. 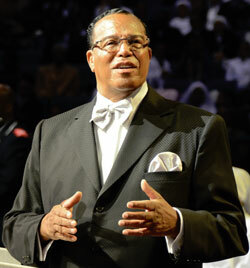 In his powerful message that was also webcast live via internet, Minister Farrakhan addressed a broad spectrum of topics such as the Nation of Islam's relationship with The Church of Scientology, and the value of L. Ron Hubbard's Dianetics Auditing Technology; as well as providing guidance and warning as it relates to the world's focus on the current events taking place throughout the Middle East. Now, over this last year, I have said that we, the Black people of America, are the real “Children of Israel” of your scriptures. And I have explained the meaning of this to no challenge. God is indeed present. And He has made His choice of the people for His Glory. The scripture teaches even the Gentiles will come to “the brightness of their rising.” (Isaiah 60:3). 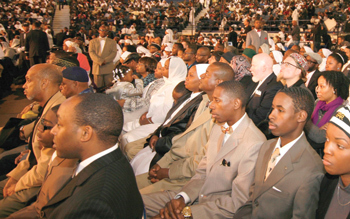 Maybe you don't know it, but there are many Whites who are now writing to the Nation of Islam and telling us that they believe in the Teachings of the Honorable Elijah Muhammad. And this is a sign of what many of the Gentiles have always known, but they have not been strong enough to say it. But they see, and they hear us saying things that are in their hearts! And they see us rising; and they are now saying boldly that they will help us. God has chosen us for a specific duty and function. We are that people, then God will have to free us from the people to whom we are bound. And since they have already let us go, but they don't want to say it openly, we want to force them to say, “Yes, we let you go”—but then you have to provide us with a good sendoff. Diverse crowd listens intently to Min. Farrakhan’s message. And if you don't provide us with what is required to let us go, then God will fight you, and now is fighting for our deliverance. The Honorable Elijah Muhammad said that Master Fard Muhammad, the Man Who Saviours' Day in the Nation of Islam honors, studied 42 years to deliver us. We were never told all that He studied, but in order to deliver us from the powerful hands of those who oppress us, He first had to study The Enemy that would work to prevent us from being taken. And then, He would have to study the means and the method by which He would bring the power of The Enemy to nothing. So Isaiah the prophet said, “Comfort ye, comfort ye my people…” I want you to know that it is you, in this time of our distress, whom God is going to comfort, because a Comforter has come to take us out of the distress of our 450 years of suffering under the oppressive hand of an open enemy. And this one who has come, according to the scriptures, he came alone because there was none to help him. So the scriptures taught that his own right arm, it upheld him. This man, Master Fard Muhammad, Elijah Muhammad said of Him that He came to us from the Holy City of Mecca, in Arabia. He was born February 26, 1877. He knew His future when He was six years old: He saw himself pushing the DuPonts, the Rockefellers, and the House of Rothschild—this Synagogue of Satan—into a Lake of Fire when He matured. Master Fard Muhammad was made from Black and White so that He could slip in among us undetected, as the Bible teaches “He would come as a thief in the night.” The Honorable Elijah Muhammad said of this Man that He is a world traveler Who had visited every inhabited part of our planet. He spoke 16 different languages, and wrote 10. He extracted the language, and pictured the people on Mars. He told us of life on all of the planets. He spoke the language of the birds. It was Master Fard Muhammad Who pointed out to us a dreadful-looking Plane in the sky, a half-a-mile by a half-a-mile. A Plane that had Two Natures and Two Functions like Himself: He is a Saviour, but He also is a Destroyer! And that Wheel that is above our head has those same Two Functions. One to heal, one to save; one to replenish, one to renew the Earth and the people on it! But another that is to destroy The Enemy of Peace, so that those who live on our planet after such a destruction will never again have to worry about a mischief maker or peace breaker, breaking the Peace of the members of the Human Family! Audience listens to Min. Farrakhan’s message. In the Book of Isaiah, Chapter 40, the questions are asked: “Who else has held the oceans in his hand? Who has measured the heavens in his fingers? Who else knows the weight of the Earth, or has weighed the mountains and hills on a scale?” What kind of Man is this Who came among us? Master Fard Muhammad told us that the total area of land and water of the planet Earth is 196,940,000 square miles; that the circumference of our Planet is 24,896 miles; that the diameter of our Planet is 7,926 miles; that the Land is 57,255,000 square miles; the Water is 139,685,000 square miles. The Atlantic Ocean covers 41,321,000 square miles; the Pacific Ocean covers 68,634,000 square miles; the Indian Ocean covers 29,430,000 square miles; the Lakes and the Rivers cover 1,000,000 square miles. The Hills and Mountains cover 14,000,000 square miles; The Islands are 1,910,000 square miles; the Deserts are 4,861,000 square miles. Mount Everest is 29,141 feet high; the Producing Land is 29,000,000 square miles, and that the Earth weighs six sextillion tons, the unit “6” followed by 21 zeroes. Master Fard Muhammad taught us the diameter of the Sun: 853, 000 miles. He taught us the diameter of our Universe: 76 quintillion miles. He taught us the Speed of Thought: 24 billion miles per second. He weighed the water of Lake Michigan! This is a God coming after a people that need a God to save them! This is He Who came. This is the Son of Man that the world has been looking for. He came from the East to the West, as it was written “for wheresoever the carcass is, there will the eagles be gathered together.” He had Power, as the Book of Habakkuk prophesies: “His brightness was as the light; He had horns coming out of his hand, and there was the “hiding of His Power.” Think about a God so angry at the condition of His people, and the misuse of the power of the oppressor against His people, that His own fury upheld Him. His own fury kept him going! The Bible teaches He had for a long time held his peace, but now He would cry out like a “woman in travail”; and Isaiah saw Him treading the winepress alone, His garments stained with the blood of His and our enemies. Yes. That is The One I represent today. That is why we have no fear of the power of these “little babies” in comparison to The Power that has made Itself known in North America, and now throughout the world! Let me make you acquainted with Him: He comes as a “thief in the night.” He comes to “spoil the goods of the strong man.” The One that has come, has come to destroy this present world and burn it with unquenchable fire. The Bible teaches in Malachi 4:1, “For, behold, the day cometh, that shall burn as an oven; and all the proud, yea, and all that do wickedly, shall be stubble: and the day that cometh shall burn them up, saith the LORD of hosts, that it shall leave them neither root nor branch”—this is The Time of the destruction of The Enemies of God, The Enemies of Peace, and The Enemy of a Righteous Civilization. Master Fard Muhammad has Unlimited Power to heal, to regenerate the Earth, and purify it from the stench of The Wicked who have poisoned the Earth, the atmosphere, the water, and poisoned the very hearts and minds of the Human Family. Whether you know it or not, this is the Time of War, so the prophet Joel says in Chapter 3, verse 9: “Proclaim ye this among the Gentiles; Prepare war, wake up the mighty men, let all the men of war draw near; let them come up…” Prepare war—not peace! And He wants to kill them all! All that love war over peace, that love wrong over right, and love injustice over justice! This is The Day of Your Doom! The End of Your World has arrived! What you're looking at happening in Tunisia, in Egypt, in Yemen, in Jordan, in Libya, in Bahrain will soon—very soon—happen in all the nations of the world. And even sooner to take place in America, so don't you get “bent out of shape” with what you see happening there! While it's happening there, you better prepare, because it will be coming to your door, America! And I hope that President Obama will remember his instructions to other nations: “be careful how you attack and kill innocent people who are protesting.” Take your own words into your bosom, and be reminded when it comes to your door! This is a sign that The Great Mahdi that the Muslim world has been looking for is present in the world. That “The Christ” that you hoped for, “The Christ” that you longed for is present in the world. And all tyrants will be set down—God is stimulating the rise of the masses, and soon it will come to America's shores. Indeed it has already begun.